It’s late. And dark and a wee bit nippy. I’m sitting on a solid Soviet-era bench on a deserted square, looking at the entrance to the Russian border and wondering what to do. A nearby bar - named, of all names, Old Trafford - has just kicked me and my friend Ingrid out. On the nail of 11pm. Now, Ingrid can speak Russian and knows an awful lot about many things, but this place isn’t really her patch. It’s a slightly surreal start to the Station Narva festival weekend. Despite Estonia being a small country, Narva isn’t somewhere where many Estonians actually go. For one the city, which has certainly seen better days, has the reputation of being pretty tough. Secondly, Narva is predominantly Russian speaking, almost a country within a country. And finally - sadly - we can’t forget politics. Those interested in current affairs will note that Narva has recently been talked of as a potential flashpoint between the Russian Federation and the EU. But I’m sure Narva will sort things out given time; very much like this festival did over an exhilarating weekend. Perched on the fast-flowing river Neva, the city has always been a place of comings together; whether “boutique festivals” or violent clashes, or economic initiatives with the onus on cooperation and friendship. It’s a place for statements going back centuries. You can literally trip over fortifications here, whether built by the Danes, Russians, or the 17th Century Swedish military architect, Dahlberg. Then there’s Kreenholm, Station Narva’s mainstage setting and once the biggest cotton mill complex in Europe. This was a place where a few hundred Lancastrian weavers and industrialists were invited just after the bitter Crimean War to advise on the creation of a monstrous Slavic Cottonopolis. Narva, then, is a subtle and complex place; boasting a very rich cultural history and not one to bow to nanosecond 21st Century appraisals. And a place that boasts a civic character that revels in risk. 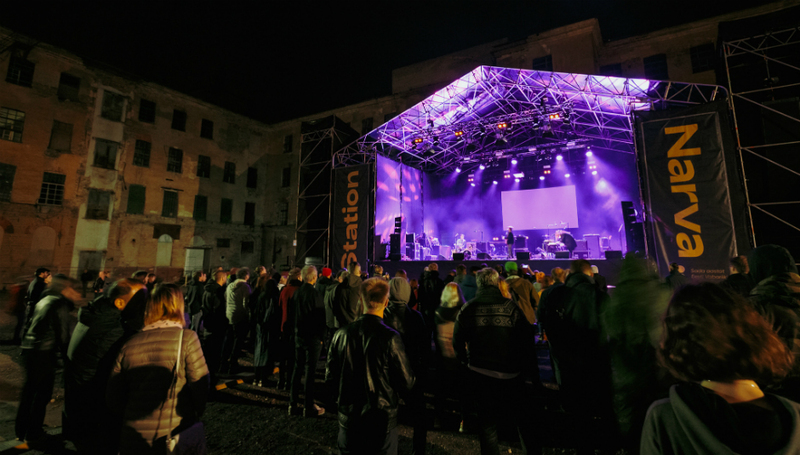 The Station Narva festival has been planned for a year but the weekend forever feels on the edge of disorder. An event in a place where they don’t really “do” events; one where the organisers actually seem to enjoy the low grade, L.A.N.-style chaos of it all. Where the two local football teams' ultras have come together to make sure the locals are suitably enthused… It’s the absolute antithesis of any showcase festival I have ever attended. We see this latent wildness in the gigs. Take Shortparis for starters. This remarkable, incendiary Russian band took the opening slot after an unexpected late cancellation, playing to about 40 curious early birds in the magnificent Kreenholm courtyard. And yet, despite the weirdness of playing a huge stage, slap bang in the middle of a vast 19th Century courtyard to an initially tiny crowd, the gig was spellbinding. Shortparis, knowing they can’t showboat, pressed out monstrous slabs of dark, electronic soul and pulverising New Beat. Their music - going higher and higher with every devotional gesture, every gyration, and every thump and clash - started to take the form of that sliver of obsidian which lines our innermost thoughts. 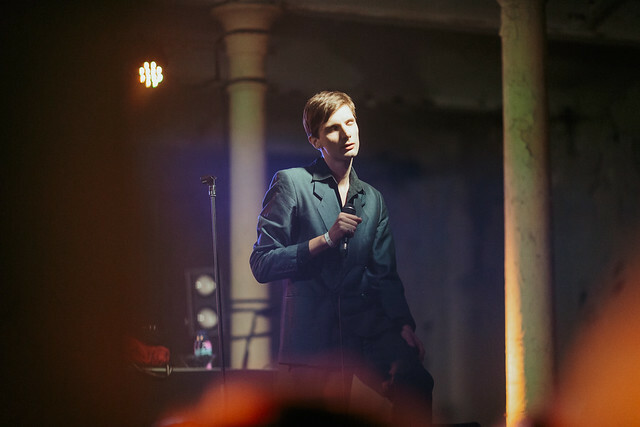 We also felt the wildness of the Beebilõust gig, where the loquacious and snappy Estonian rapper - jailed a few times and obviously not someone you’d want to wind up - seemed to be caught up in the heady emotional spiral of the night; forever on the point of walking out, or laughing or kicking off. Whilst Tricky and Actress entertained the crowds on the main stage we explored the fringes for the things you’d never see back in the West. In this, we were nobly aided by a bar-come-serving hatch named The Pharmacy in one of the “Joy Division-esque” weaving sheds. 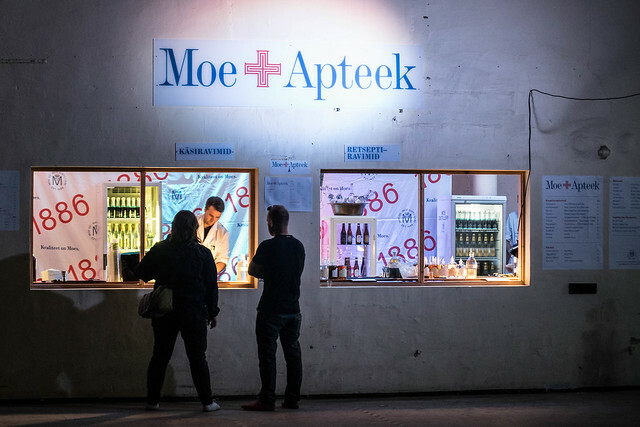 Staffed by grinning middle-aged chancers and pretty girls dressed as doctors and chemists, The Pharmacy’s wares certainly helped fuel the crowd to go ape to arch pranksters RSAC (Red Samara Automobile Club) who were nuts and charming in equal measure. I suppose RSAC, on this sighting at least, are best described a sort of Russian/Estonian Super Furry Animals guitar-soul act moonlighting as rave band. Just to make things that little bit more unpredictable, lead RSAC chap Felix Bondarev's dad, Alexander Aamissepp (a formidable jazz guitarist in his own right) added some wild licks to make everything enjoyably pear-shaped. Then there was Zahir; a brilliant, simpatico Estonian stoner band who pulverised the crowd with a set of tripped out drones drenched in fuzz and delay. The lyrics were delivered deadpan in a Blues Explosion drawl, and seem to be about nothing at all. They’ve doubtless been through the mill, played a million gigs of incredibly high-quality drone-out rock to every empty backstreet bar between here and Tartu. The drummer finished everything off with some Fluxus style deconstruction of guitar-squall and cymbals, whilst showing a fine builder’s arse. Heroes all. Again strange things were whispered in my ear. Apparently, the droll singer flips burgers for a living and his mother was an actress, once tipped as the most beautiful woman in Russia. Where was my mind at this point? Later, we found ourselves talking to Shortparis about the quality of Imperial Evil on the bridge overlooking the weir outside Kreenholm. Reports reached us of crazy gigs, impromptu beauty contests, classical jams and fisticuffs in Art Club Ro-Ro. Surely this borderland is a waking dream. Narva has a timeline that is entirely its own. One thing we soon noted was that you can’t phase the locals, who grooved around on their own inner plane, impervious to our affected Bohemian ways. This feeling somehow revealed itself best with the splendidly cheeky t-shirt I bought after attending a wide-ranging talk about regional and national identity. The tee displayed a picture of two mouths engaged in the act of, (well), tonguing. One tongue emblazoned with the Russian flag, the other the Estonian. The image was cooked up by local art students for the festival and pretty much symbolises the city’s funny, independent and self-reliant character. 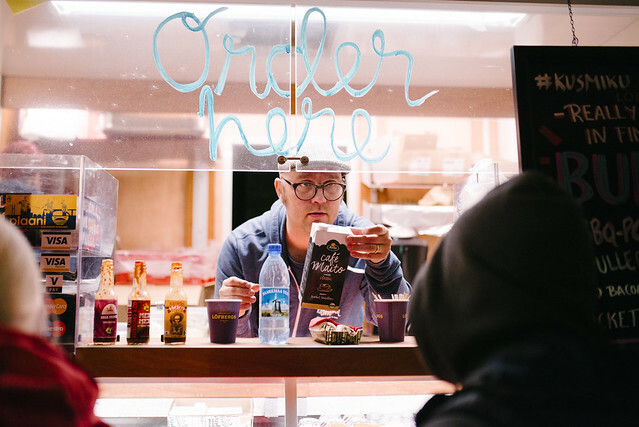 We noted this character best on the second day, firstly during the Around Town gigs in the FAMA shopping centre, where polished, punchy Icelandic rappers Fever Dream did battle with doughty matrons buying cured meats. This self-reliance has an otherworldliness about it; a sense of distance. 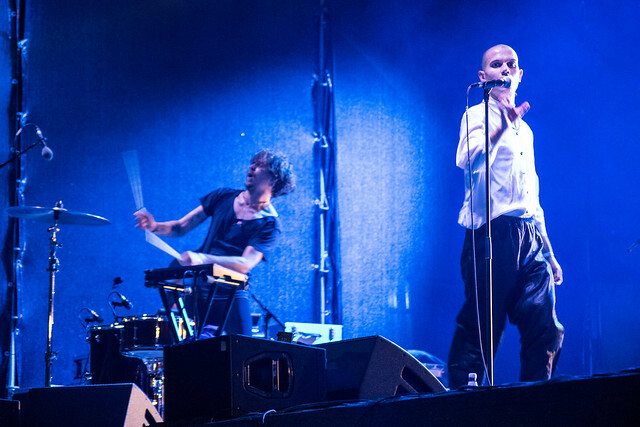 And this feeling started to weave itself into the sonic narrative of day two, where four splendid gigs took the festival to some Russo-Estonian inner plane. First up at the imposing Kreenholm centre stage was Joensuu 1685. It’s been a long time since I had seen them, a decade in fact; which is a shame as their blazing debut record from 2007 promised great things. Then matters went suddenly quiet, other projects and priorities were pursued and somehow this powerful, emotive Finnish band slipped out of mind. Kreenholm was maybe their second gig after a reformation and was a reaffirmation and revelation rolled into one. Tracks from their debut LP circled round the centrepiece, a marathon, raga-like cover of Springsteen’s ‘I’m On Fire’ (which in my mind’s eye almost became a dustbowl road movie in itself) and a pulverising, sense-shattering, neverending take on ‘Crystal Light’, which threatened to propel us through the shaman’s drum. Further shamanism was to be found with the great Mart Avi, who spat out his brilliant post-post-whatever pop to a large, almost meekly submissive audience in one of the weaving sheds. For once the sound was powerful in the lower register, allowing the formidable beats and bass parts to inform his catchy soul music, and for Avi to unleash a shuddering, neverending groove that prowled around the hall like a panther. And lawksamercy, the visuals were clear too, and very much part of the trippe; somehow combining up the voodoo spirit of Doctor John with heavy 21st Century microchip pop, Gabriel-Ernest style. As ever with Avi, there had to be a gesture, a challenge, a playful riposte. Jumping off amps, seemingly having a fag MES-style behind a speaker and lounging about on stage Man Who Sold the World style, Avi was in his element. This had the desired effect; people were grooving, eyes closed, inhabiting their own space whilst remaining with Avi’s unique worldview. If this man is not replacing Donald Trump soon as the world’s most popular man I’ll eat my boater. Over at Kreenholm, attention was mostly focused on the first coming of Echo & The Bunnymen on Estonian soil. The gig was a triumph, the spectacular setting and old-style, “proper” audience (no phones, just rapt attention) only helped Echo kick out a set that was at worst great, at best utterly magical. People grabbed the crash barriers and shook them as one of the great songbooks in recent rock history whizzed by. Heavy on Crocodiles and Ocean Rain material and the singles, we got a memorable take on ‘Never Stop’, a most groovy version of ‘Bedbugs’ a pounding ‘Over the Wall’ and one of the best ‘Killing Moon’ takes in decades (for this old git anyway). 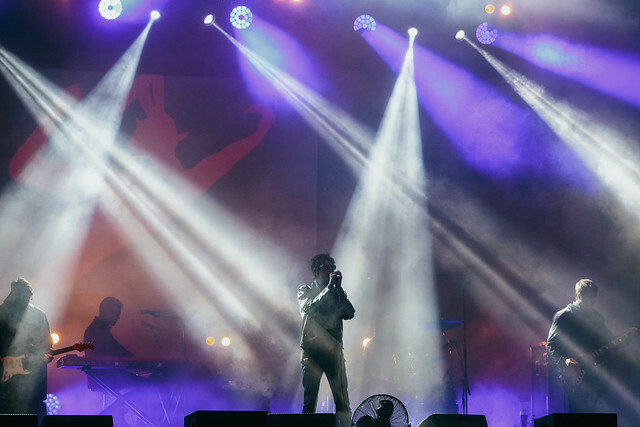 And a new track, ‘The Sonambulist’; which contained all the magical, spiralling, beautifully strange ingredients of classic Bunnymen material. The place started to get mildly unhinged; shrieks and wails and shouts and gyrations flowed forth; beyond any sensible Estonian’s wildest waking imagination. Called back for an encore, communal emotional meltdown was triggered when the band struck up ‘Ocean Rain’. A couple pressed against the barrier hugged each other as if for dear life, crying nonstop at this beautiful gliding track, perhaps the band’s most mystical song. When they are on this form that old Billy Drummond quote about them smashing through the gates of heaven is the only one to use. It could have been easy to walk away and miss Gazelle Twin after that, but that would have been to miss out on what became the dark denouement of the night. This gig throbbed and rolled, the menace of the duo’s music was well to the fore, its deep vortexes and sways lashing us like a wave hitting a pier. This was the prism refracting a different light to the good vibes from outside. The feeling that we were in a Gothic psychodrama was heightened with Elizabeth Bernholz’s almost rapacious stage presence. A strict mistress to her crowd, no-one was allowed to walk away and medicine had to be taken whole. This feeling of being caught up in an inner play, or strapped to a sofa watching some strange late-night transmission was a cathartic one in the end, duly shaken we staggered off to meander through the now silent complex, feeling we’d somehow passed into another reality entirely. Just so we didn’t get off the hook, a driver with no ears (seemingly chewed off) ferried us to club Ro-Ro, where we talked late into the night about English and Russian literature. Everything felt cool and accepting, everything possible. Narva is surprising. Maybe it’s fitting on reflection that the couplet from the Bunnymen single ‘Bring on the Dancing Horses’ got an airing-from-source on the night. "Shiver and say the words / Of every lie you've heard", could be applied to most people’s perceptions of this city, after all. Pray to your God there’s a next time. 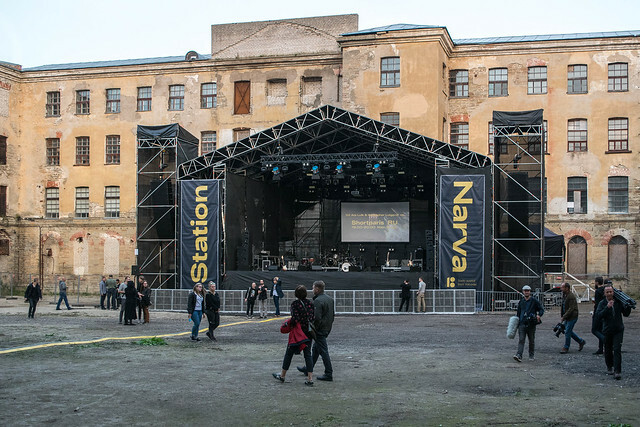 Station Narva took place in Narva, Estonia. For more information about the festival, please visit their official website.